Here's one of the yummier ways we know of to enjoy grilled chicken breasts: Serve them on a salad made with market-fresh veggies and crumbled feta. Brush chicken with 2 Tbsp. dressing. Grill 6 to 8 min. on each side or until done (165ºF). Meanwhile, combine remaining dressing with all remaining ingredients except cheese in large bowl. Place on 4 plates. 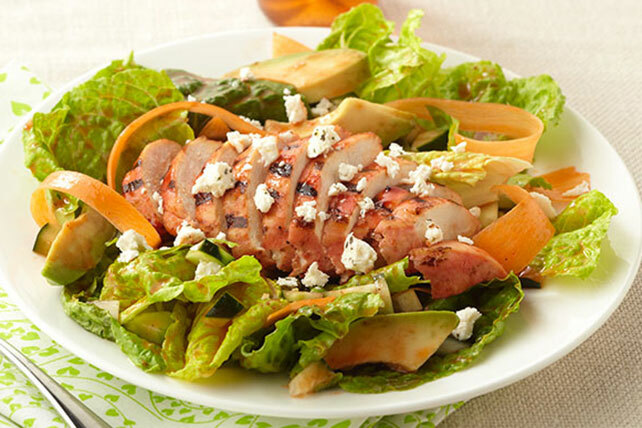 Slice chicken; place over salads. Top with cheese. This is a great way to use up leftover cooked chicken breasts.